These are some frequently asked questions about fiscal sponsorship with the Arts & Business Council that have come up over time. These are general answers and your project’s fiscal sponsorship agreement may contain specific provisions that are a little different. In all cases, the signed Fiscal Sponsorship Agreement is the binding document. Please do not hesitate to get in touch with us at info@abcnashville.org if you have any questions about how fiscal sponsorship works. Fiscal sponsorship is a contractual arrangement in which a 501(c)(3) nonprofit organization offers its legal and tax-exempt status to another group for a project or an activity related to the mission of the nonprofit organization. This alternative to starting your own nonprofit, or by using a fiscal sponsor while waiting for your organization’s determination to come back from the IRS, allows you to seek grants and solicit tax-deductible donations under the sponsor’s exempt status. Using a fiscal sponsor, a non-exempt individual, project, event, or organization can take advantage of a lot of the benefits of a tax-exempt nonprofit organization. Legally, any existing tax-exempt nonprofit organization can act as a fiscal sponsor but, because of the legal complexity and administration required, not all nonprofits will do so. If you’re looking for a fiscal sponsor, it’s best to partner with an organization with which you have a good relationship, and/or one that has an existing fiscal sponsorship program. Organizations also offer different types of sponsorship agreements or relationships, so make sure to do your research on what will be the best fit for your project. What type of fiscal sponsorship does the Arts & Business Council provide? The Arts & Business Council provides fiscal sponsorship under the Pre-Approved Grant, or Model C, arrangement. With this relationship, the sponsored project is a separate legal entity whose purpose is aligned with the Arts & Business Council’s mission and purposes, and we strongly suggest that it is incorporated in the state of Tennessee as a nonprofit organization. What does a fiscal sponsor do? Why is fiscal sponsorship valuable? Brings experience to the project and may provide such additional aids such as administrative services and/or strategic planning assistance. Fiscal sponsorship is a good solution for organizations (or certain individual projects or events) that only want to do a few small projects over a specified period of time, those who don’t have the time or staff for a lot of organizational administration, or those who need to be able to receive tax-deductible donations while they wait for separate 501(c)(3) nonprofit status approval from the IRS. Of note, in a Model C relationship, the sponsor only funds projects to the extent that the project is able to raise their own funds. Does this make my project or organization a nonprofit? No. Receiving fiscal sponsorship from the Arts & Business Council does not make your project a nonprofit or charity. Fiscal sponsorship is intended for organizations that are waiting for their 501(c)3 determination, are a one-time project, or are organized in a way where it doesn’t make sense to become a separate nonprofit. Under fiscal sponsorship, the project will still be liable for its own tax reporting. Consult with a tax professional to determine what type of tax filings may be appropriate. Does this make my project a part of the Arts & Business Council? No. Your project is a separate legal entity and is not an agent or legal representative of the Arts & Business Council. Your project is responsible for its own tax filings, and owns its own work products and equipment. Project staff or volunteers do not work for the Arts & Business Council. The project is a part of the Arts & Business Council only in the sense that the Arts & Business Council provides enabling support for you to receive funds that would otherwise be inaccessible, as well as some training, educational resources, and administrative guidance. Who owns the result of the project? Though the donated funds are the legal responsibility of the Arts & Business Council, the project remains a separate legal entity and retains ownership all of its work products and outcomes. Any tangible or intangible property, including copyrights, obtained or created by the project are the sole property of the project. How do I explain this relationship to funders or others? Your project is an independent entity, acting under fiscal sponsorship of the Arts & Business Council. After you notify us of the potential funding source(s) you intend to approach, and at the appropriate time in the application process, the Arts & Business Council will prepare a letter to the funder confirming the sponsorship and provide any other information they require. Generally, this type of information is sent along with a full proposal, not with initial inquiries. Don’t wait until the last minute to tell us you need the letter or other materials for the funder you are approaching with a full proposal. We request at least two weeks advance notice. However, when a funder asks for your organization’s budget, financial statement, Board of Directors, or other materials – what they really want is your information, not the Arts & Business Council’s. Who is eligible for the Arts & Business Council’s Fiscal Sponsorship program? The Arts & Business Council’s program is designed for projects that advance our mission to create a thriving, sustainable creative culture in greater Nashville. Our sponsored projects must have a nonprofit purpose, and the project’s main activities must be based in Tennessee. A “nonprofit purpose” means that the organization or project’s mission comes before any individual’s advancement or profit motive. That mission must also be in service of some aspect of the public good. The Arts & Business Council can sponsor sole proprietorships, nonprofit corporations, or single-member LLCs that are nonprofit in purpose and meet all other eligibility requirements. We cannot manage funds meant for for-profit purposes and will not manage funds on behalf of for-profit corporations (S and C corps) or S, C, or P classification LLCs. What are my responsibilities as a fiscally sponsored project? 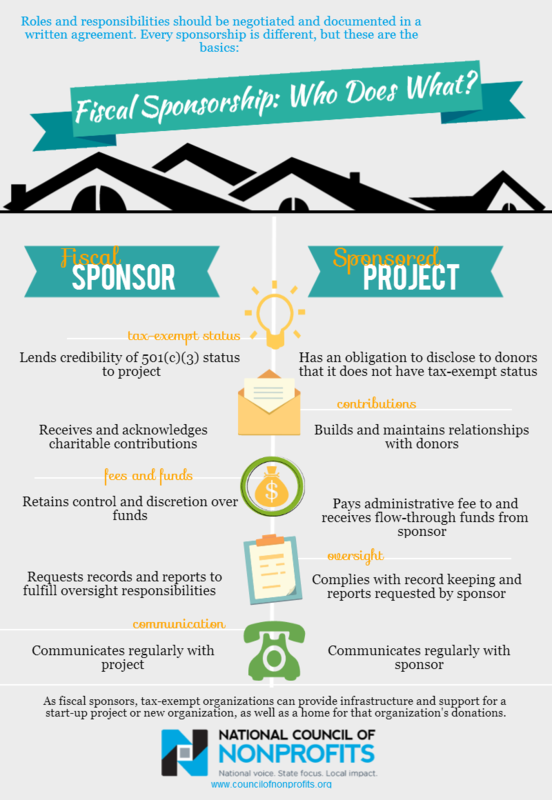 This infographic from the National Council of Nonprofits visualizes the fiscal sponsorship relationship well. Why do I need to send information about my project's activities to the Arts & Business Council? Your project must document and send information about its activities to the Arts & Business Council as you would for any other funder because the Arts & Business Council has assumed liabilities to the IRS about the charitable nature of your project. The Arts & Business Council maintains records that document its oversight ensuring that your project is furthering a charitable mission and purpose. The only way that we can maintain those records is if you keep us apprised of your activities. Eventually I want to get my own nonprofit status but I’m not sure what I need to do. Can the Arts & Business Council help? We sure can! Our Volunteer Lawyers & Professionals for the Arts program has helped a lot of new nonprofit organizations through the start-up process. Fiscal sponsorship is a good testing ground, and we have the legal and consulting resources that can help you figure out your next steps. I only have a few projects and I’m not interested in forming a separate nonprofit. Can I still be sponsored by the Arts & Business Council? Most likely, yes. The Arts & Business Council sponsors creative projects and organizations of all sizes and stages. We’d love to chat with you about the long-term plans for your project and see if it is a fit for fiscal sponsorship. Email info@abcnashville.org in order to set up a time to talk with us about your project. I’m a member of an artistic partnership, trio, or collaborative, and we would all like to share the administrative burden equally. Is that possible? For fiscal sponsorship purposes? Absolutely. However, you likely will need to compromise in order to meet IRS tax requirements. Tax requirements depend on your project’s business structure and we strongly recommend consulting a tax professional for more information. What are my tax responsibilities under fiscal sponsorship with the Arts & Business Council? All of the Arts & Business Council’s fiscally sponsored projects are self-managed, Model C organizations, which means that they are responsible for filing their own tax return. Fill out a 1099-MISC form for any individual(s) you pay a total of $600 or more during the calendar year. Claim all income from the Arts & Business Council on your tax return and deduct project expenses by filling out a Schedule C.
If you are a corporation in Tennessee that has yet to file their application for 501(c)(3) or is waiting on the IRS is as a sole proprietor, then you may need to complete a 990, depending on your budget size. We strongly recommend consulting a tax professional for more information. Is there a cost for my project to participate in the Fiscal Sponsorship program? Yes. Sponsoring organizations nearly always charge fees to cover administration costs of the program. That being said, the Arts & Business Council offers fiscal sponsorship because it is an important part of our nonprofit mission, and the fees do not cover the full administrative cost of the program. Our costs include an application fee ($50 for Arts & Business Council members, $100 for non-members), a $25 on-boarding fee should you be accepted into the program, a $75 annual fee to maintain membership in the program after the first 12 months, and a monthly maintenance fee of 7.5% of any funds that are deposited with us. We also charge rush fees if we need to accommodate requests for materials on short notice. Please get in touch with us to discuss the fee structure in more detail. The primary benefit of fiscal sponsorship is the ability to receive tax-deductible donations for nonprofit work, but the Arts & Business Council also offers several services and discounts to our sponsored projects. Access to the Arts & Business Council’s other program and services, including Arts Board Matching, as well as discounts on certain Education seminars. How does my project or organization apply for fiscal sponsorship? Potential projects can determine their eligibility with the short checklist below. Eligible candidates can continue to the online application form. If you still have specific questions, you can email info@abcnashville.org. Is there a deadline to apply for fiscal sponsorship? How long does the review/approval process take? Sort of. Applications can be submitted at any time and are preliminarily reviewed by the Arts & Business Council staff every month. This review allows for follow-up questions or revisions if further information about your project is needed. Then, applications are presented to a selection committee for final approval. The selection committee makes fiscal sponsorship decisions on a quarterly basis (February 15th, May 15th, August 15th, November 15th), so the overall process from the time we receive your application until a decision is made may take about 3 months. Currently the Arts & Business Council’s Fiscal Sponsorship program is limited to a total of 15 projects. You can view our current roster of projects in order to gauge capacity and competitiveness of a particular application cycle. My application for the Arts & Business Council's Fiscal Sponsorship program was approved! Now what? Way to go! We’re excited to have you on board. We’ll send you a contract to review, sign, and return to us along with proof of insurance for your project. Once we have a signed contract and proof of insurance on file, we’ll set up your Arts & Business Council bank account and send you links to online forms and tools to help manage your project with us. Then, you can start fundraising! The Arts & Business Council’s Fiscal Sponsorship’s contract terms are valid for one year, and can be renewed indefinitely as long as the project is active and in compliance. Contracts can also be terminated by either party with 60 days notice (If, for example, a sponsored project obtains their own federal tax exempt status, the project would no longer need a fiscal sponsor and could “hatch” from the incubation of fiscal sponsorship.) Once a fiscal sponsorship relationship with the Arts & Business Council ends, we will keep your records on file for five years. We have donors, grants, or an organization ready to give a contribution. How do we get the money? Grants and donations MUST be made out to or processed by a fiscal sponsor organization to be tax deductible. Once your project is accepted into the Fiscal Sponsorship program, donors can send checks, with your project name in the memo, to the Arts & Business Council for deposit. We will deposit your funds and hold them for you in a separate checking account. To get those funds, you’ll need to fill out a secure online funds request form, and we will send you a check. We process deposits and cut checks once a week. Do people donating to my project get a tax deduction? Yes! Checks from individual donors, as well as grants or charitable sponsorships from organizations, must be made out to the Arts & Business Council in order for them to be tax deductible. Make sure they write the name of your project in the memo line so we don’t mistake the donation as ours instead. We cannot accept checks that are made out to your organization, and we cannot accept donations from someone else through you (i.e., if you were to deposit a donation check into your own account and then write the Arts & Business Council a check for the same amount). Can my friends and family donate money to my project online? Why, yes they can. On the Arts & Business Council’s “Donate” page, there is an option for donors to select your project as the beneficiary. Our payment processor takes a small percentage for credit card processing, so we recommend that checks are sent to our office in order to receive the full value of the donation. The project is done but I have another idea! Do I need to reapply for the Arts & Business Council to sponsor the next project? Not necessarily. As long as your subsequent project fits with our mission and is consistent with our program and tax-exempt guidelines, then we can probably transition your account into your new organization/project. We’ll have a conversation about your project and see if it is a continuing fit for fiscal sponsorship. Email info@abcnashville.org in order to set up a time to talk with us about your project. My application to the Arts & Business Council's Fiscal Sponsorship program was approved but I didn’t get the grant I applied for. What happens now? Bummer – it happens to the best of us. You might not win them all, but don’t give up! Not receiving funding doesn’t affect your contract with us, and we’re able to sponsor your project as long as you’re interested in pursuing tax-deductible funding. We also often offer fundraising and grant writing workshops through our Education program if you’re interested in brushing up on your skills. As a sponsored project, how can I make this fiscal sponsorship run smoothly? Be aware of your deadlines – it makes things easier for everyone (and avoids rush fees). Many of our sponsored projects are interested in applying for the same grants, so our plate gets filled up fast for the popular ones. Since all projects are applying for tax-deductible donations using the same EIN, it will be first-come, first-served. Make sure your donors make checks out to the Arts & Business Council and not to your organization, and write your project’s name in the memo field. Keep track of your records. It’s always good to be prepared. Keep the Arts & Business Council aware of what’s going on. If you’re exploring new funding, making changes, or have new projects coming up, let us know. We’re here to help you. Quick check: Is your project eligible? The project must be located in Tennessee, and have its main activities happening in the state, though additional programming can occur elsewhere. The project’s activities must be for 501(c)3 charitable purposes. The project’s mission and purposes must be aligned with the Arts & Business Council’s mission and purposes. Back to fiscal sponsorship, or apply now.